Kirkpatrick model – rings a bell? Well yes, I am sure you have come across this term sometime. Especially if you are responsible for conducting trainings or involved in the learning and development activity at any level for your organization. You will agree that for most organizations, the search for efficient and talented employees is always an ongoing process. I am sure it is no different for you. Employees that can easily deal with new challenges and work in varied work environments are a prized catch. And then, you also need them to stay motivated, keep learning and get better results. To achieve this, you want to make sure that the efficiency and performance of the organization is regularly evaluated and well-maintained. Effective training programs act as an important factor to determine capability of the employees that in turn helps in enhancing the efficiency of the organization. The main objective of such training program is to analyze the training effectiveness of the employees. To understand the level of the employees’ growth and performance, the management organizes workplace training evaluation programs at regular intervals. The process of training evaluation is not a one day process. It involves continuous monitoring of the employees’ performance at work place as well as while dealing with new challenges. For organizing a training program you must evaluates employee performance not only during or after the training program but even before planning or organizing any such program. Evaluating the employees’ skill and level of knowledge before the training enables you to decide the aspects or the skills that the organization lacks in. On the basis of this evaluation, you can then decide on the type of the training program to be conducted. Which training evaluation approach should you follow? You have the option to follow various training evaluation approaches like the Kirkpatrick model, a four-level Training evaluation process, Keller’s ARCS model, etc. 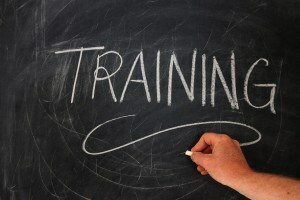 to determine and understand the training efficiency of its employees and of the organization as a whole. The Kirkpatrick model is one of the well known approaches used for measurement of the training effectiveness of the employees and trainees of a training program. This is a 4 level evaluation model used to analyze the effectiveness and results of training programs along with ways to identify & improve the limitations of the participants for future benefits. It basically involves four levels of training that highly depends on the performance of the participants both physically & psychologically. This is the first level to evaluate the trainees’ reaction to the training. While you may want them to feel great about the training experience, there may be certain elements missing. Measuring reaction enables you to incorporate these missing elements and further enhance the training for the next batch of trainees. This is the next level that measures the amount of learning and increment in knowledge the trainees have attained. This is also a measurement of whether the learning objectives were achieved. Once you know the level of learning of your trainees and further areas of improvement as well, it helps you chalk out improvements in the next training program. The third level of Kirkpatrick model evaluates key behavioral changes in the trainees based on training received. However you must not assume that the training was ineffective if there are no behavioral changes as it is possible that the management has not allowed any active application of knowledge. There is also a chance that learning is complete but there is resistance to apply the knowledge on the job. And finally as in every organizational activity, you evaluate the results of the training conducted. Specific outcomes which are considered beneficial for your organization must be set and you must analyze if the training impacts those outcomes. Thus to describe in brief, this model analyzes the response and reaction of the participants to the topics dealt in the training program and how effectively they apply the training into use in their job or while dealing with different work place challenges. The whole idea behind using a certain model, approach or assessment software is not only to enhance the performance level of the participant/s but also to understand the training needs of your organization as a whole. The practice of continuous assessment and evaluation of the employee performance or learning ability encourages positive changes and improvements both at the personal as well as professional level. No matter what is the approach used for evaluation of a training effectiveness, the training can only be effective and appropriate when the participants accept the learning process and its results whole heartedly, moreover positively. If you have ever used the Kirkpatrick model of training evaluation in your organization, we would be keen to hear your experience in the comments.